December 1st - the Great Union Day - is Romania's national day, a public holiday, so on the practical side, expect most of public institutions and even private ones to be closed, while traffic in Bucharest to be diverted in certain areas due to the military parade which will be organized in the city. Romania celebrates the great unification of 1918, during the reign of kind Ferdinand I. It was then when Romania – made of Moldova and Wallachia at the time – was united with Transylvania, Crisana, Banat and the Maramures area. The hot spot of the unification was Alba Iulia, were the unification declaration was read during a public event, attended by over 100,000 Romanians. The declaration was read by Vasile Goldis, Romanian academician and politician. 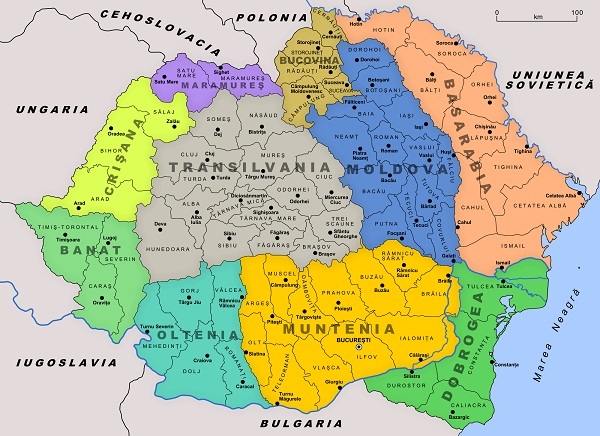 Romania of that time also include the Republic of Moldova (Basarabia), Banat and the Cadrilater area, which are no longer part of today's Romania. In 1918, with this unification, Romania almost doubled its territory. Romania lost Basarabia and Bucovina in 1940, after the Molotov-Ribentrop pact, the two regions being annexed to the Soviet Republic. The north of Transylvania went to Hungary, while the south of Dobrogea (the Cadrilater area) went to Bulgaria. Romania fought against the Soviet Union to regain Basarabia and Bucovina, then changed parties and after the war, the Paris Peace Treaty in 1947 re-established Romania’s sovereign rights over Transylvania. More about Romania's history in our Making of Romania article here. The December 1st holiday is usually celebrated in Romania with a military parade in Bucharest. Over 380 troops will march under the Arcul de Triumf in the capital city.Traffic will be closed between 05,00 hours and 14,00 hours on the Kiseleff boulevard, between the Free Press Square and Victoriei Square, on Str. Alexandru Constantinescu, on Bd. Alexandru Averescu, on Bd. Constantin Prezan, on Bd. Marasti and Str. Ion Mincu. Sos. Bucuresti-Ploiesti – Piata Presei Libere – Piata Montreal – Bd. Marasti – Bd. Al. Averescu – Str. Turda – Podul Grant. Piata Victoriei – Bd. Aviatorilor – Bd. Nicolae Caramfil – Bd. Aerogarii – DN1. Sos. Stefan cel Mare – Str. Barbu Vacarescu – Bd. Aerogarii – DN1.